In March 1942, Pauling took an odd step. Instead of first publishing his ideas about artificial antibodies in a peer-reviewed scientific journal, he sent out a press release. 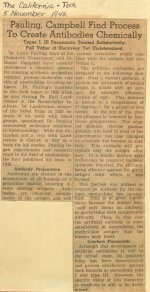 The announcement that his laboratory had successfully created artificial antibodies was picked up by the wire services and reprinted widely in newspapers. Announcing a discovery of this importance in the popular press before subjecting it to scientific review was almost unheard of. But Pauling was in a hurry. He figured that he and his primary assistant in the antibody work, a skilled immunologist named Dan Campbell, had gathered enough data to support his claim. Not that the results were crystal clear. Months of work with beef globulin had not yielded the definitive sorts of data they might have wanted, but Campbell and his assistants had succeeded in getting a low, variable level of what appeared to be specific binding with various antigens. The strength of this binding was lower than that with natural antibodies, but it appeared to be real. Perhaps a bit more tinkering with the methods of denaturation and renaturation would boost the yields. In the meantime, though, Pauling thought the research results were strong enough. It fit with his theory of antibody formation. They should be seeing artificial antibodies. So Pauling decided that they were. His press release also highlighted Pauling's entrepreneurial approach to science. He needed more grant money to perfect his artificial antibody system before commercializing it. The publicity he generated would help him get the money he needed. The Rockefeller Foundation was already interested in this work, and so was the government's Office of Scientific Research and Development (OSRD), which was overseeing a good chunk of the federal moneys being funneled into wartime scientific research. Pauling played them against each other, using the interest of one group to spur the interest of the other. Even without a paper in a peer-reviewed journal, there was Pauling's reputation to consider. He was not thought to be a scientist who made idle boasts. If he said his artificial antibodies were real, they probably were. On very short notice, the Rockefeller Foundation granted Pauling $31,000 for his work in immunology, including $20,000 to pursue research into the preparation of artificial antibodies. See Also: Letter from Linus Pauling to Warren Weaver. November 18, 1941. See Also: Letter from Linus Pauling to Wendell M. Stanley. May 11, 1942. See Also: Letter from Linus Pauling to Alfred E. Mirsky. May 30, 1942. Dan Campbell and Linus Pauling in a Caltech laboratory. 1943. "Pauling, Campbell Find Process to Create Antibodies Chemically." November 5, 1942.